Four differently sized multi media rooms for meetings and conferences provided with all the elements necessary to perform any kind of work in the most functional and interactive way. Room 1/2: 15/18 people capacity, chairs, a table, a computer, an internet connection, a flipchart, air conditioning, and heating are provided. Room 3: 36/38 people capacity, chairs, tables, a computer, a flipchart, an internet connection, air conditioning and heating are provided. 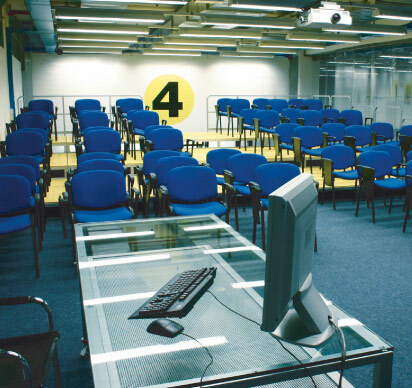 Room 4: 80/90 people capacity, chairs and attached desk, a table, a computer, a screen, a video-projector, microphones, a dvd reader, a flipchart, an internet connection, air conditioning and heating.